Community solar has taken off within the renewable energy development leagues, melding the interests of residential and commercial or industrial customers, as well as the local utilities. While the inclusion of low- and middle-income (LMI) residential customers are widely enabled by state legislation on community solar, specific carve-outs or percentage requirements for LMI customers are less common. At times, solar developers have focused heavily on anchor commercial or industrial customers and paid little attention to residential participation, much less the LMI segment. To help remedy this practice of under-weighting LMI customers in community solar development, local housing authorities have stepped up to bring their resources — if not regulations — to bear, early in the planning process. Developers also have found that the housing authorities and other social institutions can be valuable partners in locating and enrolling customers in a project well ahead of ground-breaking. Read more here. 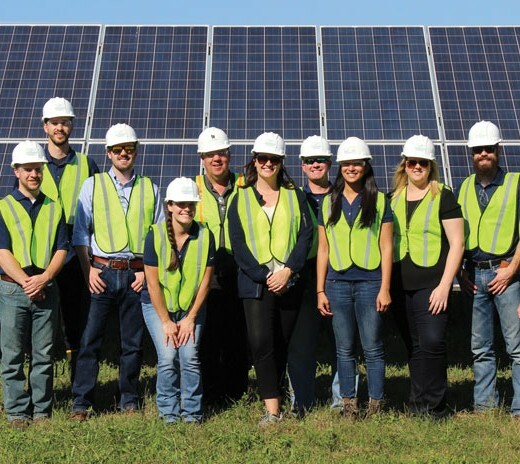 Photo: Geronimo Energy team celebrating another community solar install in Minnesota, which recently sold a 100-MW community solar portfolio in Minnesota to Berkshire Hathaway. Technology jobs, requiring skilled training, are a focus of Nebraska policymakers, Norfolk Daily News. The workforce issue is more of a problem in western and central Nebraska compared to areas around Lincoln and Omaha. – Jamie Karl, Nebraska State Chamber of Commerce vice president of public affairs and policy. This entry was posted in Nebraska / Midwest News and tagged community solar news, renewable energy jobs, renewable energy news in the Midwest on December 4, 2017 by Helen Deffenbacher. 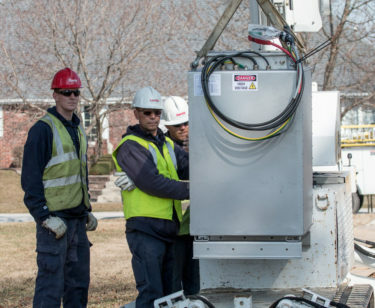 A new pilot project from Illinois’ largest utility is bringing energy storage out from behind the substation and into the neighborhood. It’s part of a broader experiment in Community Energy Storage (CES), or the deployment of medium-sized batteries in between those found in utility-scale applications and the kind of personal, home-battery systems offered by Tesla and others. Photo: ComEd crews lower the Community Energy Storage unit into the underground vault near customers’ homes in Beecher, Illinois. This entry was posted in Energy Storage, Nebraska / Midwest News, NewsBlog and tagged Community Energy Storage, energy storage, Iowa Extension Publications on Solar Energy, Nebraska Extension Publications on Solar Energy, property values & renewable energy, renewable energy news in the Midwest, solar photovoltaic energy for agricultural operations on April 10, 2017 by Helen Deffenbacher.